An oval shaped, yellow citrus fruit with flesh that is generally contained in 8 to 10 segments. It has a bright yellow skin that can be thin and lightly textured or thick and heavier textured. When the lemon's flesh or juice is added to sweet and savory dishes, it provides a mildly tart, fresh flavor. The outer skin of the lemon, which is referred to as zest, contains a lot of flavor that can also be used to enhance the flavor of foods. Lemons have many uses in cooking and are very popular in European recipes. They are very high in vitamin C and low in calories. Lemons are also used as a health and beauty aid, and have many uses as a cleaning agent. Lemons are rarely eaten raw but are used to flavor many sweet and savory dishes. They are used in sauces or as an accompaniment to fish and poultry. Sauces and foods containing lemon juice help in the digestion of fried foods. Lemons are also used in baked goods and desserts to provide a light, fresh flavor. They are also used as a garnish, in the form of a slice or wedge added to the plate. Lemon zest (the yellow part of the peel) is also often used to add flavor when cooking and baking. Besides adding flavor, lemons are used for other purposes when preparing food. Their high content of vitamin C is the ascorbic acid needed to prevent the discoloring of the flesh of fruits and vegetables that oxidize quickly when exposed to the oxygen in the air. Lemon juice can be used to tenderize meat or it can be used as a substitution for vinegar in dressings. Lemon juice added to steamed vegetables will help them keep their bright colors and enhance their flavor. It can be added to beverages for a refreshing flavor. The composition and properties of lemons also make them a natural health and beauty aid. They are used to fight infections and provide soothing relief for coughs, sore throats, and flu symptoms. Lemons and limes were used back in the 18th century on British Navy ships to prevent and treat scurvy among the sailors. 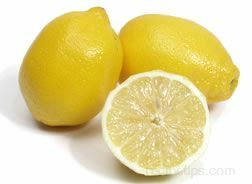 Lemons can be used in home beauty treatments to rejuvenate the skin and is found in many commercial beauty products. Lemon juice is used to lighten sunspots on the skin and put highlights in hair. 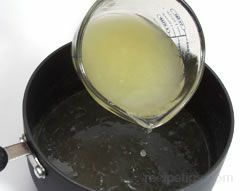 Lemon juice is also used as a cleaning agent. It acts as natural bleach for stains on fabrics and is used as a hand cleaner to remove odors from the skin. Lemons are a very versatile fruit with endless uses. See the list of Tips below for some of the many ways in which lemons can be used. Lemons are available throughout the year. Select lemons that are bright yellow in color and have a shine to their skin. Choose those that are as thin-skinned as possible and heavy for their size, because they will produce the most juice. Avoid lemons that have any green tinged areas, which is an indication that the lemons are not fully ripe and will be more acidic. Also avoid dull pale colored lemons and those with blemishes, soft or hard spots and shriveled skin, which are all signs of over mature fruit. Over mature lemons lose their acidity and begin to dry, producing less juice. Lemons can be stored at room temperature for approximately a week if kept out of the direct sunlight. If they are not going to be used within a week, store them in the refrigerator where they will stay fresh for 2 to 3 weeks. Leftover fresh squeezed juice can be stored in an airtight container in the refrigerator for up to 5 days. 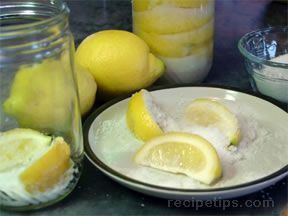 Lemon juice and zest can be stored for longer period of time by freezing them. Place grated zest in an airtight freezer bag or container and store in the freezer. Freeze lemon juice in ice cube trays until solid and then place in airtight freezer bags or containers and store in the freezer. A knobby, thicker-skinned lemon than the Lisbon lemon. The Eureka lemon has a short neck at the stem end and contains a moderate amount of juice. This variety of lemon generally contains some seeds. The Eureka and Lisbon lemons are very similar in flavor, aroma and acidity. A smoother, thinner-skinned lemon than the Eureka lemon. The Lisbon lemon does not have a definite neck at the stem end but the blossom end tapers to a slight point. This variety of lemon is generally seedless and contains more juice than the thicker-skinned Eureka, but otherwise the two varieties are similar in flavor, aroma and acidity. Meyer Lemon is a variety of lemon that is known for having a sweeter flavor, tasting mildly like a tangerine. It is often used as a seasoning for fish, providing a fresh aroma and a sweeter flavor than the standard lemon. This lemon is often used to season fish and seafood. When a Meyer lemon's flesh or juice is added to a dish, it adds a sweet and only slightly tart flavor. Meyer lemons are more difficult to find but as they increase in popularity they are becoming more available in specialty markets. Lemons have many uses but preparing them for use is fairly basic. It will generally involve, zesting, juicing, slicing or peeling. Some of the preparation tools and basic preparation methods are described below. 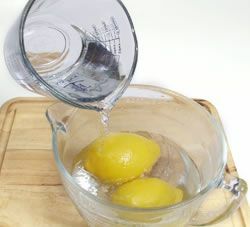 Before preparing the lemons in any manner, they should be washed thoroughly to remove any dirt, bacteria, or pesticide residue that may remain on the surface. Paring Knife - The tip of the paring knife is used to cut thin strips of zest from the outer peel of the lemon. 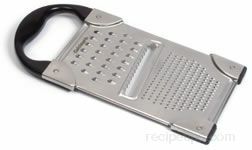 Vegetable Peeler - A vegetable peeler can be used to cut wide strips of zest from the outer peel. 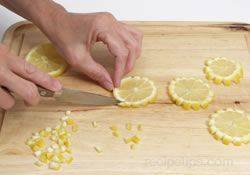 Strips can be cut vertically from one end to the other or by cutting strips around the lemon, starting at one end and working around and down towards the opposite end. 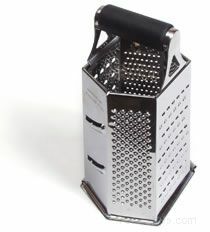 Grater - A metal grater can be used to produce fine particles of zest. 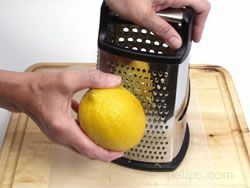 The surface of the lemon is rubbed diagonally across the grater and the lemon turned often to avoid grating the layer of white pith. 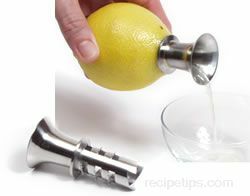 Citrus Zester - A zester tool can be used to remove fine strips of zest from the surface of the lemon. The tool is pulled across the skin to remove the fine strips, which can then be used as strips or minced to produce a finer zest. Citrus Trumpet - A tool used to extract the desired amount of juice from citrus fruits. This tool is screwed into the lemon and the outer rind is squeezed until the desired amount of juice flows out the spout of the extractor. This type of tool is also known as a juice extractor. 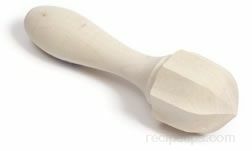 Reamer - A hand tool that is typically used to extract juice from citrus fruits, such as oranges or lemons. This kitchen utensil has a fluted cone-shaped reaming end that is twisted into and against the meat of the fruit to release the juice. It is available in hard plastic, wood, or metal. The hand reamer is primarily made to extract smaller volumes of juice from fruits during food preparation. 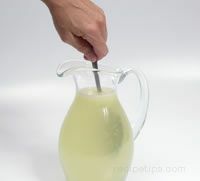 Hand Juicer - Hand juicers are generally built with a solid ribbed cone that is attached to a shallow bowl type base or it may be a separate piece that attaches to a base that is used for collecting the juice. The lemon half is pressed down onto the cone and turned manually. As it revolves around the cone, the pulp is crushed and the liquid flows into the bowl or holding platter below. Wash lemons thoroughly before cutting. 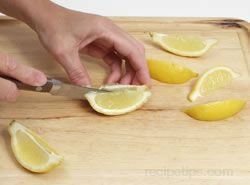 To create lemon slices, cut the lemon in half crosswise and then cut slices crosswise from each half. Cut the slices 1/8 to 1/4 inch thick. 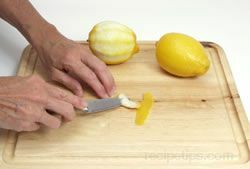 To use as a garnish, cut the lemon slice from the center out to the edge, through the skin. Twist each cut end in opposite directions to form a lemon twist. 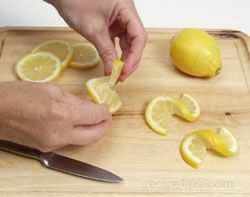 To dress up a flat lemon slice, cut little notches out of the outer peel in even intervals. Cut lemons in half lengthwise. Cut each section lengthwise again to create wedges. 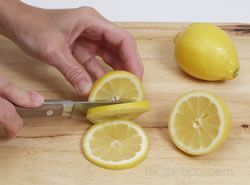 Each lemon half can be cut into two or three wedges. The number of wedges cut from each half will depend on the size of the lemon and on the desired thickness of the wedges. 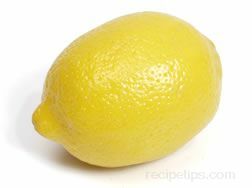 Lemon zest is the yellow outer peel of the lemon, which provides an aromatic flavor that enhances the flavor of many foods. The white part of the peel beneath the zest is the pith, which has a bitter taste. When removing the zest from a lemon, care should be taken to not remove the white pith along with it. The zest can be removed as thick or thin strips, very thin strands or grated pieces. Shown below are some common methods used for creating zest. Wash lemons thoroughly before beginning preparation. 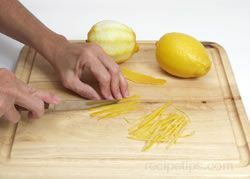 Lemon zest strips can be made by using the tip of a small knife and cutting vertical strips off the lemon. Be careful not to cut into the bitter pith layer. 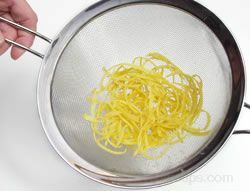 Lemon zest strips can also be made by cutting vertical strips from the lemon using a vegetable peeler. The zest could also be removed in the same manner that you would peel an apple with the vegetable peeler. Start peeling at the stem end of the lemon and instead of cutting vertically, cut around the lemon, working down towards the blossom end. 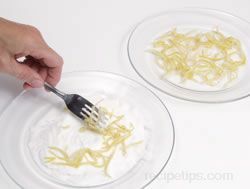 Be careful not to cut into the bitter pith layer when cutting strips of zest from the lemon. If you do get some of the pith layer, use the tip of the knife to cut or scrape the pith from the zest strip. 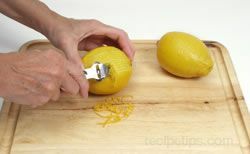 To grate the lemon zest, rub the lemon diagonally against a metal grater, making sure to turn the fruit so that you are taking off the yellow part of the peel and not the white pith. Grating the lemon peel will produce fine pieces of zest. 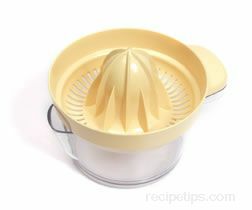 A citrus zester can also be used to remove the zest from the lemon. The zester removes the zest in fine threads, which can be used just as they are or they can be minced and used as an alternative to grating. Lemon juice can be used to make a refreshing beverage by adding water and sugar to fresh lemon juice. It is also used to enhance the flavor of many dishes. It can be added to both sweet and savory dishes to provide a fresh flavor. Because of it high content of ascorbic acid, lemon juice is also brushed on fruits and vegetables that brown easily when exposed to air or it is added to water and the fruit is soaked in the acidulated water for a short period of time to prevent it from browning. 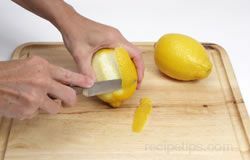 Shown below is a common method of removing the juice from the Lemons. The lemons should be room temperature or warmer before the juice is removed. This will make it easier to squeeze the juice from the fruit. Trim zest from two lemons using a vegetable peeler. Cut wide strips, being careful to not cut into the pith layer below. Cut strips lengthwise to create thin julienne strips. 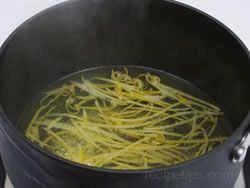 Place julienne strips in a small saucepan and cover with cold water. 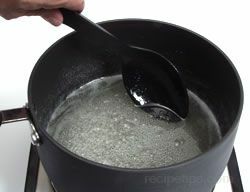 Cook over medium heat until the water comes to a simmer. Continue to simmer for 6 minutes. 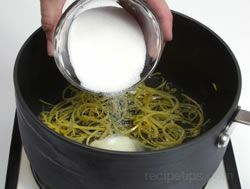 Add 1/3 cup of water and 1/3 cup of sugar to the lemon strips in the saucepan. Bring the mixture to a simmer. Continue to cook over low heat until the lemon strips turn translucent. 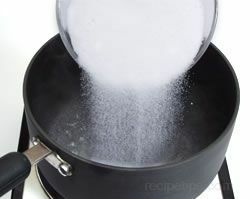 The water and sugar should be starting to thicken. Cooking time will be approximately 10 to 15 minutes. Separate the strips on the wax paper and allow them to cool slightly. Once they have cooled slightly, roll in sugar until they are well coated. 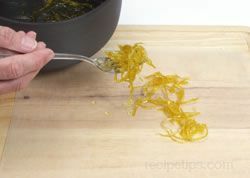 Allow the candied strips to cool completely before storing in an airtight container or bag. Store at room temperature for 2 or 3 days. The lemons should be room temperature or warmer before the juice is removed. This will make it easier to squeeze the juice from the fruit. 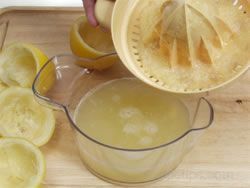 Remove the juice from 8 to 10 lemons to produce 1 1/2 cups of lemon juice. See Lemon Preparation above. When cooking with lemon juice, if possible, add it at the end of the cooking time or after the dish has been cooked to minimize or prevent the loss of vitamin C.
When cooking fresh vegetables, squeeze lemon juice on them to keep their colors bright. Prevent browning of fresh cut fruits and vegetables by dipping into a mixture of 1 cup water and 1 tablespoon lemon juice or by brushing fruits and vegetables with lemon juice. One pound of lemons equals approximately 4 to 5 medium whole lemons and 2/3 to 1 cup of juice. One medium lemon equals approximately 2 to 3 tbsp. of juice, 2 tsp. 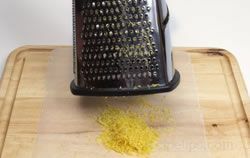 grated peel, and 7 to 10 slices. If only a few drops of lemon juice are required, poke a toothpick through the skin of a lemon and squeeze out the small amount needed. Insert the toothpick back in the hole and place the lemon in a plastic sealable bag. Refrigerate to use at another time. 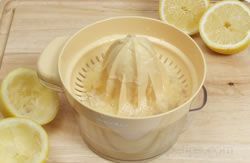 Another method that can be used to make lemons easier to extract the juice is to freeze them for 24 hours and then thaw in the refrigerator before juicing. 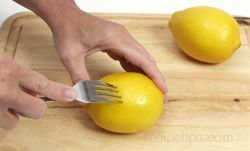 To prevent lemon wedges from squirting juice in unwanted areas, pierce the flesh of the lemon wedge with a fork before squeezing. 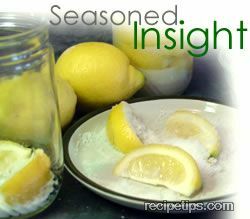 Cut down on the amount of salt used on your food by adding lemon instead to enhance the flavor of the food. For fluffier rice, add lemon juice to the cooking water. Lemon juice can be used as a marinade to tenderize meat. Use lemon juice in place of vinegar in salad dressings. When serving lemon halves with fish, tie the lemon in cheesecloth so that when the lemon is squeezed the juice will be extracted but the seeds will remain in the cheesecloth. For stains on Formica counter tops, squeeze enough fresh lemon juice over the stain to cover it and let soak for 1/2 to 3/4 of an hour. After soaking, sprinkle spot with baking soda and scrub softly. Rinse with clean water and dry. Clean copper items by sprinkling it with salt and then rubbing with the cut end of half a lemon. Rinse and dry thoroughly with a soft cloth. Freshen vacuum cleaner bag by adding baking soda and lemon peels. Freshen garbage disposals by running leftover lemon peels through the disposal and rinse with water. 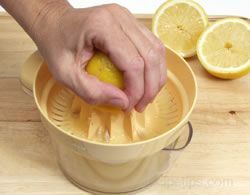 Remove food stains and odors from hands by rubbing with a cut lemon. To remove laundry stains from whites, mix 1 part lemon juice to 1 part cream of tartar and apply the mixture to the stained area. Let it stand for a few minutes and then remove with a wet sponge. To remove rust from a surface, sprinkle the area generously with salt and then squeeze fresh lemon juice over it. Allow this mixture to sit for several hours (over night if necessary). The salt and lemon juice mixture should draw out the rust stain from the affected area. For rust on washable clothing, apply salt and lemon juice to the rust stained area and then place it outside in the direct sunlight. Expose it to the sun until the stain disappears, keeping it moist with lemon juice during this time. When the stain has disappeared, brush the salt from the clothing and wash as you normally would. To use as a cough suppressant, mix 1 part lemon juice and 2 parts honey. Do not give to children under the age of 1 year. To soothe a sore throat, drink honey and lemon tea. 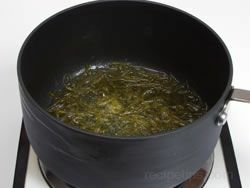 It will have a relaxing effect on the throat and will also help to suppress a cough. Ease the effects of the flu by drinking hot water with honey and lemon added. Lighten dark spot on the skin by applying lemon juice to the darkened areas. Be careful applying lemon juice to the skin if it will be exposed to the sun because it can cause the skin to be photosensitive. To create highlights in your hair, add 1/4 cup of lemon juice to 3/4 cup of water, apply to hair, and then sit in the sun.